울창한 나무숲으로 둘러싸인 곳에 북향으로 자리잡은 기와집으로 순조 25년(1825)에 지었다고 한다.집의 진입로에는 보호수로 지정된 은행나무 두 그루가 서있고, 바깥마당에는 무지개처럼 휘어진 소나무 줄기가 대문을 대신하고 있다. 'ㄷ'자형의 안채와 '一'자형의 중문간채가 튼 'ㅁ'자형을 이루고 그 앞에 'ㄱ'자형의 사랑채가 있어 전체적으로 '日'자형의 배치를 하였다. 안채의 왼쪽으로는 3칸의 광채가 있고, 사랑채 오른쪽 앞에는 초가로 2칸의 헛간채와 4칸의 바깥채가 있다. 안채는 5칸 겹집에 양쪽을 홑집으로 꺾어 덧붙여 'ㄷ'자 모양을 이루고 있다. 대청 앞쪽에는 후대에 시설된 듯한 유리문이 있고, 대청의 왼쪽으로 제사에 쓰였던 곳으로 보이는 2칸의 찬방이 있다. 사랑채는 앞면에 툇마루를 두었고, 모두 덧문을 달았는데 이것은 북향집이기 때문에 비바람을 막기 위하여 후대에 설치한 것으로 보인다. 안채와 사랑채를 가로막고 있는 중문간채는 중문을 들어서서 곧바로 안마당을 향해 있지 않고 꺾어들어 가도록 하였다. 특별한 정원시설은 없지만 집안 곳곳에 매화·소나무·향나무·감나무 등을 심어 아름답게 꾸몄다. 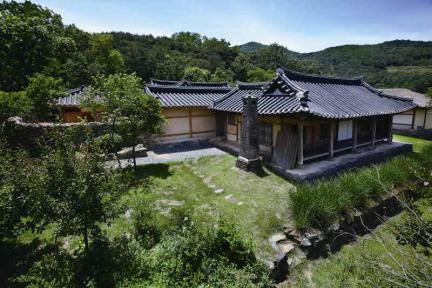 This tile-roof house facing north sits on a land surrounded by a dense forest, seemingly built in the 25th year of the reign of King Sunjo of the Joseon Dynasty (1825). At the entrance of the house are two ginkgo trees designated as protected trees. An arch-shaped pine branch in the backyard is being used as the gate of the house. The square bracket-shaped anchae (women’s quarters) and “ㅡ”-shaped middle gate quarters form the “□”-shaped layout together. The “ㄱ”-shaped sarangchae (men’s quarters) is in front of the anchae, forming an overall “日”-shaped arrangement. 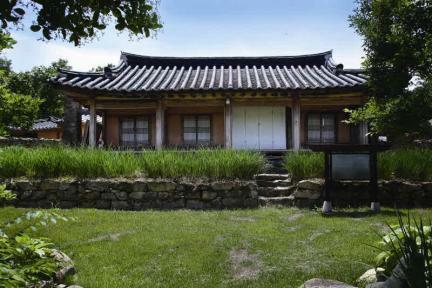 On the left side of the anchae is a 3-kan (a unit of measurement referring to the distance between two columns) storage shed. On the right side of the sarangchae are a 2-kan barn shed and a 4-kan annex. The 5-kan anchae consists of several wings, but a single wing is added to each side, forming a square bracket-shaped layout. 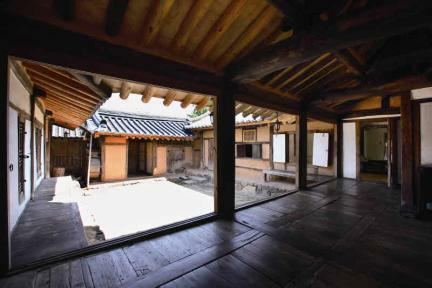 In front of the daecheong (main wooden floor) is a glass door that seems to have been installed in modern times. On the left side of the daecheong is a 2-kan pantry for memorial services. 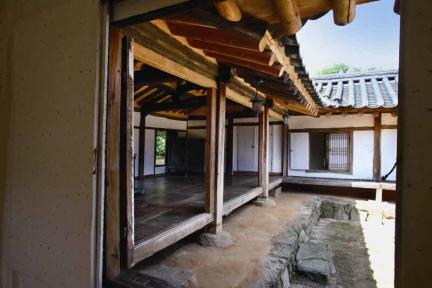 The sarangchae has toenmaru (wood-floored veranda) in front with a double door put by descendants to keep wind and rain out since this house is facing north. 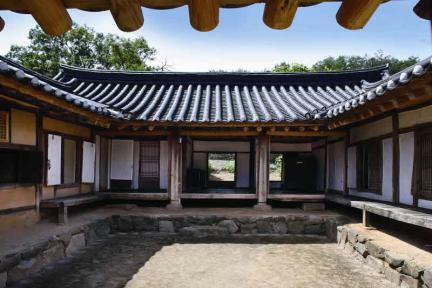 The middle gate quarters were built in front of the anchae and sarangchae to ensure privacy. Although there is no garden in this house, many plants such as apricot trees and pine trees grow beautifully in several parts of the house. ※ Viewing of the cultural property above is usually available anytime but may be limited depending on the owner’s personal circumstances.